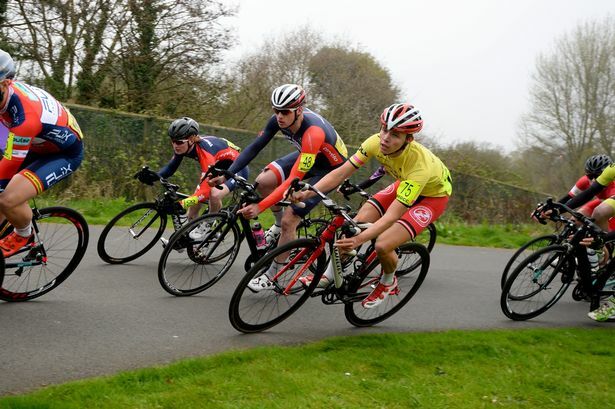 Will Harper delivered an all-Cornish victory in the South-West’s biggest road race, the Totnes-Vire Two-Day, when he won the third and final stage with perfect timing over a wet and windy 70 miles at South Brent. Harper, from St. Agnes and riding for the Duchy’s Saint Piran team, helped to instigate a key break on the fifth of seven laps between South Brent, Avonwick and Marley Head, and only Michael Ford of London’s Latchem Sunwise Race Team was still with him at the finish. Harper was too strong for Ford in the uphill sprint finish, but within minutes of crossing the line, the former ONE Pro Cycling rider was heading back down the course to help care for his teammate Jake Alderman, who had crashed just as the peloton was winding up for its own sprint. Alderman sustained a shoulder injury in the fall, but was able to attend the post-race presentations. Third on the day and second overall was Polish pre-race favourite Marcin Bialoblocki of Wiltshire’s Steele Davis-Via Roma squad. Bialoblocki ended up regretting a 40-second penalty he picked up for arriving at his Haytor time-trial ‘slot’ a minute late in Saturday morning’s opening stage. Bialoblocki, who was faster on the Haytor hill than Harper, finished only 25 seconds down on the General Classification, so that penalty ultimately cost him victory. “I wasn’t sure where the start-point for the time-trial was, but that was my fault,” said the popular ex-Grand Tour rider. The other main contender for overall victory was 21-year-old Paul Double from Winchester, riding for the Anglo-Italian Zappi’s Racing team. Double had made history by breaking the 39-year-old course record on Haytor. He covered the iconic three-mile climb in 12mins 36secs, eight seconds faster than Jeff Williams (Manchester Wheelers) had done to win the national hill climb championships back in 1979. Double even borrowed his father’s bike to ride the climb – his own best machine was back at his base in Italy. He and all his closest rivals maintained their advantage during the second stage, a high-speed one-hour ‘Criterium’ at Paignton’s Torbay Velopark circuit on Saturday afternoon. They included Exeter duo George Kimber (Team PB Performance) and university student Tom Nancarrow and two more local challengers, Torquay junior Harrison Wood from the host Mid-Devon CC and Buckfastleigh’s Ashley Towey of Somerset’s Team Tor 2000-Kalas team. National Junior Hill Climb champion Kimber clocked 13.10 on Haytor, Nancarrow 13.11 and Wood and Towey both 13.31. Bialoblocki also recorded 13.28, but his penalty left him on 14.08. The tall Pole reduced that deficit by ten seconds, a bonus he picked up for finishing second in the ‘Crit’, won by Kieron Blay of Surrey’s TAAP Cervelo squad. So it all rested on Sunday’s final stage, where Harper earned the win which Saint Piran had targeted from the start of the season. Marked man Bialoblocki, a brilliant time-trialist, put in a trademark surge on the last lap to ride away from the peloton and finish third on his own, 18 seconds down on Harper and 25 seconds back overall. Kimber, Nancarrow and Wood finished fifth, sixth and seventh, a great result for young local riders, with Wood as the First Junior and rider from the promoting Club Mid Devon CC. 1 Paul Double Zappi Racing Team 12:36 Course Record! Thanks go to all the teams for battling against the worst that the weather could throw against them to race. Thanks also go to all MDCC members, marshalls, sign on, drivers, finishing judges, NEG, and the Police. Special thanks to Ken Robertson for his invaluable guidance.